The fifth largest cathedral in the US -- if you can see around the State Ed building. Nestled behind the State Education Building on Washington Avenue is a -- what is that? Is that a church? Yes. And that sound you hear is William Doane rolling over in his grave. The Cathedral of All Saints, Albany's Episcopal cathedral, is on a cramped lot behind its massively columned neighbor. The building is quite beautiful, and it seems odd that such a grandiose structure should be tucked away on a side street. Why didn't they get a bigger lot? We're not that pressed for building space here in Albany. What's the cathedral doing back there? Well, there's a story behind this. And it's a story of lifelong ambitions and bitter feuds, of superlatives and dreams, played out along Albany's Washington Avenue. Doane (1832-1913) was Albany's first episcopal bishop. He saw it as his life's vision to build an "American cathedral" -- the definitive U.S. Episcopal cathedral, grand and ornate on a European scale. Doane chose a young British architect, Robert Wilson Gibson, whose designs drew from those Gothic structures Doane admired, over the venerable H.H. Richardson. Had the cathedral been built as planned, its Gothic towers and eye-popping ornamentation would have helped define Albany's skyline. But from the start, funding troubles slowed the construction. "Because of the diocese's chronic shortage of funds," William Kennedy wrote in O Albany!, "Doane never acquired the remainder of the block where the cathedral stands, so in a hurry to build was he." 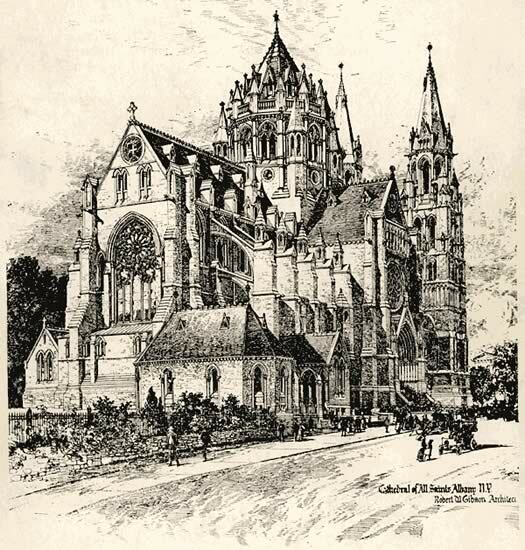 The cathedral was dedicated in 1888 although it was still not finished. Bishop Doane, who saw the cathedral as the center of a complex of diocesan buildings, worked over time to acquire options to purchase the other lots his plans required. "The cathedral is not an interest just of this city, or of my own," he wrote, "but that of the NATION, and the most permanent results depend on the success of this enterprise of faith." 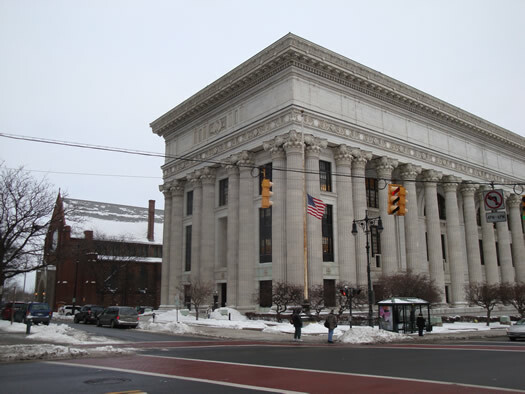 But there was another man in Albany with a building in his dreams: Andrew Sloan Draper. Draper, New York's first commissioner of education, lobbied the legislature for years for permission to create a separate building for the state education department. At last he was given the go-ahead to find a site near the Capitol. In 1906 Bishop Doane made a trip to Europe. And Draper made his move. He swept in and secured the Washington Avenue lots for his own project. The land Doane had wanted was in the hands of the state by the time the bishop returned to the country. The book Albany Architecture refers to it as a "coup." "Draper ignited a ferocious church-state battle by snapping up this site," the book notes, adding that Doane "viewed the entire block as his manifest destiny." "Although Doane succeeded in limiting the number of stories in the State Education Building, Draper maximized the floor-to-floor distances. The enmity between the two men can be seen in the height and scale of the State Education Building, which largely screens the Cathedral from Washington Avenue." The education building was dedicated in 1912. Doane and Draper died within a few weeks of each other the following year. Maybe the cathedral complex would never have been finished, even if Doane had acquired all the land his dreams required. As it is, it's still a grand and worthy structure. All Saints lists the building as the fifth largest cathedral in the United States. 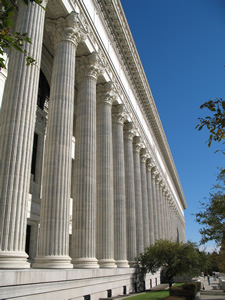 The state education building is notable in its own right: Its columned front along Washington Avenue forms the longest continuous colonnade in the world. They're both beautiful buildings. But seen in another way, there's a quiet tension between them. Earlier on AOA: The short tour of historic Albany stained glass made a stop at All Saints. Love this post -- thanks for the great backstory. When I worked downtown, I would stroll by both buildings almost daily and always find something new to marvel at on the cathedral. It really is a beautiful structure. But I would offer that it is not so much a "quiet tension" that best describes this remarkable block. Rather, it is a stark, perhaps even violent, contest over who has the right to define the experience of the city--the battle Ms. Norder refers to. That so many resources were so unabashedly spent in the projection of power in this space testifies to the importance of who gets to "write" a particular story in the landscape. Beyond the historical fight for control of a central location in Albany, what use is making conflict of this sort legible? Richard Sennett has written that "the cultural problem of the modern city is how...to relieve its current blandness, its neutrality." The visual experience of diversity and difference in the city, like the stark contrast of urban form Ms. Norder has elucidated, is implicated in the development of individuals and collectivities capable of sanely navigating the production of a "centered" public life. But it goes beyond individual reflection or contemplation to action: Sennett asserts that "the result of of caring about what one sees is the desire to make something." Perhaps we do not have enough of these types of visual experiences in our cities and suburbs. Or perhaps we have too much of the increasingly commodified experience of contemporary cities, which are littered with the symbolic detritus of corporate competition. What kind of cities are we creating? The awesome sight of the Cathedral of All Saints ensnared by the State Education Building, depicting two quite different visions--each attached to a different emancipatory project--points toward what is at stake. great piece. that is a relatively neglected (by sightseers including local ones) church. I think though you meant to write "grand." "Gradiose" has a negative connotation, it means "grand" in an ugly, pretentious, overreaching way. Adam, I agree 100%. Where's the love, nowadays?! All one has to do it walk down lower New Scotland Ave, Corporate Woods, or Patroon Creek Boulevard. The legacy? Bland. Sleepy. Neutral. Un-inspiring. Has our need to make a buck completely eclisped our sentiment to leave a better planet that we found it? Generations from now our kids will look at buildings like this and say "the people who designed these buildings must have had a lot of self-loathing." Very interesting. Thank you. It brings up a question, though. I've heard from numerous sources that the Education building used to be the NYS Museum. Is there no truth to this, then? @ questionMark: You're correct -- the museum was there for many decades. The State Ed building was built to include exhibit space for the State Museum collection. One responder above questions the use of "grandiose." Well, maybe he doesn't know the story of Bishop Doane, the First Bishop of Albany, and prior to that Rector of St. Peter's, Albany. Reputedly he was able to strut while seated. His ego was legendary and his designs after carving Albany and the North Country out of the NYC Diocese (they cared?) are reflected in his pompous writings about the Albany Cathedral having national importance...well, in his mind. He was good for the text to one militaristic, but moving hymn, known in the Episcopal Hymnal as "Old Albany" or more familiarly known as "Ancient of Days." Other than that, he has succeeded in getting his name remembered in the creation of Doane Stuart School (a unification of St. Agnes and Kenwood Schools), but his legacy lives on. I have to wonder who the Ed Commish was fronting for? The Governor, the Mayor? Somebody else didn't want "Bishop" Doane to win.